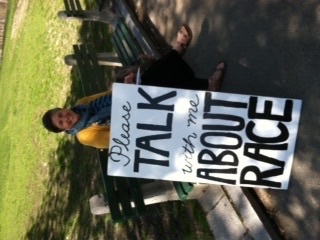 A few days ago, I shared a post about being out in front of the Nets arena in Brooklyn with the Please Talk With Me About Race sign. After an intense conversation with Donald and Crystal, two African American young adults, about a range of topics — media framing of protests, racial discrimination in criminal justice, and the impact of white privilege — both of them concluded that there wasn’t much we could do to end racism in America. I wrote that I felt a sense of despair in that moment. Jennifer in Boston, at the start of our sign “work shift” on the Common. These messages are keeping Keren and me going on this book tour and sign project. It turns out, a lot of people want to help build that rocket ship to the moon. They want to know you are willing to talk about race. Maybe you just need to give them a sign!